An airport terminal is a building at an airport where passengers transfer between ground transportation and the facilities that allow them to board and disembark from an aircraft. Within the terminal, passengers purchase tickets, transfer their luggage, and go through security. The buildings that provide access to the airplanes (via gates) are typically called concourses. However, the terms "terminal" and "concourse" are sometimes used interchangeably, depending on the configuration of the airport. Smaller airports have one terminal while larger airports have several terminals and/or concourses. At small airports, the single terminal building typically serves all of the functions of a terminal and a concourse. Some larger airports have one terminal that is connected to multiple concourses via walkways, sky-bridges, or underground tunnels (such as Denver International Airport, modeled after Atlanta's, the world's busiest). Some larger airports have more than one terminal, each with one or more concourses (such as New York's John F. Kennedy International Airport). Still other larger airports have multiple terminals each of which incorporate the functions of a concourse (such as Dallas/Fort Worth International Airport). According to Frommers, most airport terminals are built in a plain style, with the 'concrete boxes of the 1960s and 1970s generally gave way to glass boxes in the 1990s and 2000s, with the best terminals making a vague stab at incorporating ideas of "light" and "air"'. However, some, such as Baghdad International Airport, are monumental in stature, while others are considered architectural masterpieces, such as Terminal 1 at Charles de Gaulle Airport near Paris or Terminal 5 at New York's JFK Airport. A few are designed to reflect the culture of a particular area, some examples being the terminal at Albuquerque International Sunport in New Mexico, which is designed in the Pueblo Revival style popularized by architect John Gaw Meem, as well as the terminal at Bahías de Huatulco International Airport in Huatulco, Oaxaca, Mexico, which features some palapas that are interconnected to form the airport terminal. Due to the rapid rise in popularity of passenger flight, many early terminals were built in the 1930s–1940s and reflected the popular art deco style architecture of the time. One such surviving example from 1940 is the Houston Municipal Airport Terminal. Early airport terminals opened directly onto the tarmac: passengers would walk or take a bus to their aircraft. This design is still common among smaller airports, and even many larger airports have "bus gates" to accommodate aircraft beyond the main terminal. A pier design uses a small, narrow building with aircraft parked on both sides. One end connects to a ticketing and baggage claim area. Piers offer high aircraft capacity and simplicity of design, but often result in a long distance from the check-in counter to the gate (up to half a mile in the cases of Kansai International Airport or Lisbon Portela Airport's Terminal 1). Most large international airports have piers. 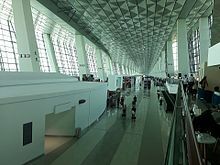 Montreal's Pierre Elliott Trudeau International Airport has terminal section called Aeroquai connected by walkways and it's used mostly for short haul regional domestic flights and some International departures when there's no gates available. 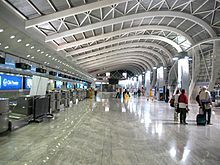 Paris's Charles de Gaulle Airport (Terminal 1), Geneva International Airport and London Gatwick Airport (South Terminal) have circular satellite terminals, connected by walkways. Lisbon Internacional Airport (Terminal 2) has a small rectangular satellite terminal, connect by a free shuttle service (accessible by Terminal 1, every 10 minutes). Orlando International Airport and Pittsburgh International Airport have multi-pier satellite terminals. Brussels Airport's Pier A is connected to the main building via underground tunnels and walkways. Zurich Airport's Midfield Terminal (Concourse E) is connected to the main terminal via an underground Skymetro. London Gatwick Airport's Pier 6 (North Terminal) connects to the main terminal via the world's longest over-taxiway bridge. At Logan International Airport in Boston, Terminal A has two sections of gates, one of which is a satellite terminal connected by an underground walkway. Denver International Airport, Cincinnati/Northern Kentucky International Airport, and Hartsfield-Jackson Atlanta International Airport have linear satellite terminals connected by central passages. The linear satellite terminals are connected by automatic people movers. Atlanta's is called the Plane Train. In the Atlanta and Cincinnati airports, underground moving walkways also connect the linear satellite terminals. At O'Hare International Airport, Terminal 1 comprises Concourses B and C. Concourse B is adjacent to the airport road and houses United Airlines passenger check-in, baggage claim and security screening landside and aircraft gates on the airside, while Concourse C is a satellite building connected by an underground walkway lit with a neon light show, and an airy and very slow-tempo version of the United theme music "Rhapsody in Blue". London Stansted Airport has one main terminal building with three linear satellite terminals all connected to the main terminal by an automated people mover. The airport is currently expanding by adding another satellite building. Kuala Lumpur International Airport has a cross-shaped satellite terminal which is used for international flights. Cancun International Airport Terminal 2 is an irregular terminal with two concourses, Main building and Satellite building, the latter one being the satellite terminal. In George Bush International Airport, Terminal C consists of the North Concourse and the South Concourse, connected by the central building where United Airlines which houses passenger check in, baggage claim and ground transportation. Terminals A and B consist of a similar design. Seattle-Tacoma International Airport has two rectangular satellite terminals connected by automatic people movers. Jinnah International Airport in Karachi has one main terminal, divided into two concourses: the Jinnah East Satellite Concourse, used for international flights, and the Jinnah West Satellite Concourse, used for domestic and some international flights. Both satellite concourses are connected to the main terminals by pedestrian walkways. McCarran International Airport in Las Vegas has an X-shaped satellite terminal, named Concourse D, that is connected by two automatic people movers - one from Terminal 1 (which houses Concourses A, B, and C) and one from Terminal 3 (which houses Concourse E). In addition, despite being part of Terminal 1, Concourse C is connected to the rest of the terminal by an automatic people mover. Concourse D is connected to Terminal 3 by an underground walkway that is only used for international arrivals. Mariano Escobedo International Airport is the first and only airport in Mexico which has a completely satellite terminal. Terminal A is connected from the main building to the satellite building via underground tunnels. Terminal 5 at London Heathrow Airport has two satellite terminals, 5B, and 5C, connected via an underground people mover. Rome Fiumicino Airport has one satellite terminal, called T3G, connected by a Bombardier Innovia APM 100. Madrid–Barajas Airport has one linear satellite terminal, named T4S, which is connected to the Terminal 4 main building by an automated people mover. Both midfield terminals at Washington Dulles International Airport use this design, with Concourses A, B, and C being connected to the main terminal by the AeroTrain, and Concourse D via a mobile lounge service. There is also an underground walkway from the main terminal to Concourse B.
Munich Airport has one satellite terminal, named Satellite Terminal 2 (commonly known as "der Satellit" in German), which is connected to the Terminal 2 by an underground automated people mover. Terminal E at Dallas-Fort Worth International Airport has a small satellite concourse, accessed by an underground pedestrian walkway. The Terminal E Satellite currently has 9 gates, but in April 2018, it was announced by DFW Airport and American Airlines that the 9 mainline gates would be converted into 15 regional gates, along with updating interior fixtures such as carpet, elevators, escalators and moving walkways. American plans to have renovations completed and be fully moved into the terminal in Spring 2019. Chennai International Airport started construction of satellite terminal which is slated for completion by 2022. Some airports use a semicircular terminal, with aircraft parked on one side and cars on the other. This design results in long walks for connecting passengers, but greatly reduces travel times between check-in and the aircraft. Airports designed around this model include Charles de Gaulle Airport (terminal 2), Chhatrapati Shivaji International Airport, Mumbai (old terminal 2), Dallas/Fort Worth International Airport, Seoul's Incheon International Airport, Jakarta's Soekarno-Hatta International Airport (terminal 1 & 2), Toronto Pearson Airport, Kansas City Airport, Nairobi's Jomo Kenyatta International Airport, Rio de Janeiro–Galeão International Airport and Sapporo's New Chitose Airport. One rarer terminal design is the mobile lounge, where passengers are transported from the gate to their aircraft in a large vehicle which docks directly to the terminal and the aircraft. Washington Dulles International Airport, Mexico City International Airport, and Mirabel International Airport have used this design. Hybrid layouts also exist. San Francisco International Airport and Melbourne Airport use a hybrid pier-semicircular layout and a pier layout for the rest. A common-use facility or terminal design disallows airlines to have its own proprietary check-in counters, gates and IT systems. Rather, check-in counters and gates can be flexibly reassigned as needed. With an area of over (1,713,000 m²) and capacity of over 60 million passengers, Dubai International Airport (Terminal 3) in Dubai, United Arab Emirates, became the largest single Terminal building in the world when it opened on October 14, 2008. 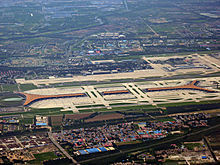 Other large scale airport terminal buildings with floor area over 500,000 m2 include Terminal 3 of Beijing Capital International Airport (986,000 m2), Hamad International Airport in Doha, Qatar (600,000 m2), main terminal of Incheon International Airport in Seoul (594,000 m2), Terminal 1 of Hong Kong International Airport (570,000 m2), Suvarnabhumi Airport in Bangkok (563,000 m2), Kunming Changshui International Airport (548,300 m2) Terminal 1 of Barcelona Airport, (546,000 square metres), and Terminal 3 of Indira Gandhi International Airport in Delhi, India (502,000 m2). Many small and mid-size airports have a single two or three-lane one-way loop road which is used by local private vehicles and buses to drop off and pick up passengers. An international airport may have two grade-separated one-way loop roads, one for departures and one for arrivals. It may have a direct rail connection by regional rail, light rail, or subway to the downtown or central business district of the closest major city. The largest airports may have direct connections to the closest freeway. Airport Transportation for there will be car rental agencies and taxi companies operating around the terminals. The Hong Kong International Airport has ferry piers on the airside for ferry connections to and from mainland China and Macau without passing through Hong Kong immigration controls. ^ The 10 Worst Airport Terminals Slideshow at Frommer's. Frommers.com. Retrieved on 2013-04-09. ^ World's 10 Most Beautiful Airport Terminals Slideshow at Frommer's. Frommers.com. Retrieved on 2013-04-09. ^ McGraw-Hill Construction | ENR – Next Phase of Baggage Screening Goes In-line, Out ofView. Enr.construction.com (2003-12-15). Retrieved on 2013-04-09. ^ New Terminal 3 to evoke 'tranquillity' – The National Archived 2014-10-16 at the Wayback Machine. Thenational.ae (2011-07-22). Retrieved on 2013-04-09. ^ Hamad International Airport Passenger Terminal Complex - HOK. Retrieved on 2017-07-24.